A lot of us are trying to add more meat-free cooking to our family meal roster. But sometimes "going veg" with kids seems like the domestic equivalent of firing a volley across the nose of a hostile opponent: conflict is sure to result. We ourselves are a "non-religious" vegetarian household, meaning that we cook vegetarian but we will eat meat if it's offered to us. One time when I mentioned we were having tofu for dinner, a friend commented with admiration, "Wow! How do you get your boys to eat tofu?" To which I replied, "I never said that my guys were going to eat it. Just that I was serving it for dinner!" Ha, ha. 3. it doesn't have to be a big deal. There are so many ways to go veg that meals don't have to look "weird" or be obviously vegetarian. 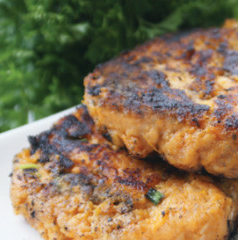 Everyone really liked the Crispy Salmon Sweet Potato Cakes that I found in Parents Canada magazine in the March/April 2011 issue. (I should note that in addition to being a "lacto-ovo" vegetarian --meaning I love my dairy!-- I also cook fish. Not really vegetarian, but there it is.) You can get the recipe on-line here. They're also pretty low-fat. Another favourite was the Steamed Spinach Dumplings recipe from the Australian Women's Weekly book Vegie Food: Low-Fat & Delicious. (Yes, the Australian Women's Weekly --apparently they have the good recipe books, or so said the woman at the cooking paraphernalia shop where I bought this. And it seems they also spell "veggie" without the second "g.") The book is available on Amazon. In short --and so as to not infringe on copyright-- you make balls from spinach, ricotta, egg, flour and seasoning and then steam them. I served these dumplings with a tomato sauce over pasta. Though my pre-schooler declined, my two toddlers inhaled them. In fact, the dumplings were so good that even my non-vegetarian in-laws asked for the recipe! I give two thumbs up for this entire cookbook. If you feel like your vegetarian repertoire is in a bit of a slump, Vegie Food gives some really fresh ideas. Anyone else have vegetarian recipe hits to share? I love "I didn't say they would eat it, just that I'm serving it!" Theo & Lily (the little girl from the family we nanny-share with) have turned their noses up at elaborate mac & cheese with pureed veggies & real cheese in favour of KD so many times it's hard to believe they don't have scurvy. Fave veggie recipes in our house are brussels sprouts shredded & sauteed with garlic, lemon juice & a bit of chicken broth (could use water, too). And I make a mean baked rice with a can of tomatoes, rice, chopped veggies & seasoning. Woo!